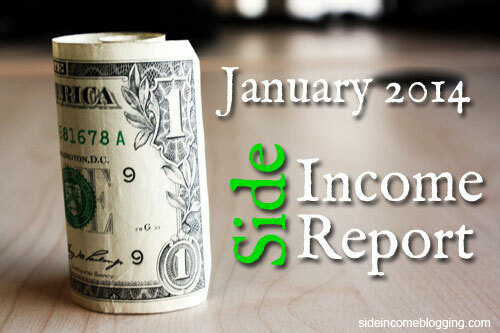 January 2014 was a busy month for me both from a full-time perspective and from a side-income perspective. As I’ve mentioned before, all of my web based work, including my services business is done part time. I have a full-time job that I’ve been in for a number of years, which serves as my main income source. In January, my full-time job kept me far more busy than normal kept me from spending the time I normally spend on my side-income work. Regardless, even from a side income perspective I was busy working with 5 different clients, writing articles for my various blogs, and publishing new reviews on my niche sites. I also started the process of revising my introduction to blogging series previously named “Start a Money Making blog”. This included renaming the series to How to start a blog, and refreshing and revising all of the content, which I am still working on. Probably one of the larger distractions and time consumers for me in January was changing hosting companies from MediaTemple to A Small Orange. The process wasn’t hard, especially since I used BackupBuddy, but it was just tedious and a bit stressful trying to minimize my downtown and making sure I didn’t mess anything up. From an income perspective, January wasn’t bad, but it didn’t meet my $1000.00/month stretch goal I’ve set for 2014 either. I’ll be working on that. I have stumbled across a services niche that I think could be very profitable. I’m not ready to share it yet, but will keep you posted. Adsense for January was the was down from December. December was a really high month for me, so the drop isn’t unexpected. I have noticed a direct correlation between frequent publishing and increased numbers, in particular on our Blue Ridge Mountain Life site. This month I’ll be focusing on publishing at least two articles a week on that site. EBay partner network income will be the last month I’ll be reporting income, as I’ve dropped my eBay based niche sites. Amazon affiliate income was down for January. Amazon pays two months behind, so January income was actually from November. My amazon based sites continue to trend upward for income, and January was actually my biggest month, but I won’t be able to show that income until March. My only expenses for January 2014 were hosting at $42.50 and Paypal fees at $18.61. Seeing the $42.50 hosting fee from A Small Orange instead of the normal $100.00 charged by MediaTemple is nice. I’ll continue to work to minimize my expenses this year.